WE REMEMBER THE OLD AIRPORT!20 YEARS AGO,ANYONE WHO REMEMBERS WILL KNOW WHAT WE MEAN. VERY HOT LATE JULY ,WOMEN PUSHING ME IN THE BACK ASKING ME TO MOVE ,NOT ONE INCH OF SPACE AS PEOPLE WHO HAVE BEEN THERE ,SO I TURNED AROUND AND ASKED IF SHE WANTED ME TO LEVITATE ...TO WHICH HER HUSBAND BURST OUT LAUGHING ,THE WOMEN STOPPED PUSHING !GREAT LAUGH BEEN BACK SINCE THEN, BUT ALWAYS REMEMBER THAT. Betsy B. 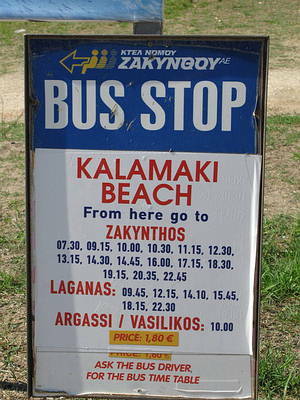 Not sure about a bus from the Airport to Kalamaki, but a taxi is only E13.00. Well worth it to not have to haul your luggage to/from any bus stop. I hope this helps. Pete. I have nothing but GOOD comments about Zakynthos Airport. I have had the good fortune to pass through Arrivals and Departures on many occasions and every time has been absolutely fine. Always met with a lovely Greek smile at Passport Control, something which is not always expressed in English Airports who seem to think it is part of their job to remain straight-faced and bugger customer relations. You do have to wait, but don't you have to wait and queue at Manchester/Gatwick/East Midlands etc? and yes, you do have to check in then take your luggage to be weighed - but I have just done the same thing in Corfu. One thing I must mention is the excess baggage charges - my experience is probably one not had by many but last year on the return journey my family's luggage was WELL over and the young lady at check in just smiled and asked if I had any hand luggage - unfortunately, no, I hadn't only my handbag! So she actually gave me four hand luggage tags which actually entitled me to an extra 40Kg so more than covered the excess weight in the cases! Will be returning in June 2013 and can't wait for the whole experience. First time using the comleted airport. good allround, arrivals and departure.Probably not like this in high season, but compares well with ours. Ma kes a great change to the old days.Wendy and Dave T.Rugby. But it's just an airport, you only use it to enter and leave the country. When you arrive surely you are happy because you are starting your holiday, and when you are leaving you are depressed coz you are coming home. So Don't Be Put Off Coming To Zante, By Stories About The Airport, I Good Now. ;; Help The Greek Ecconmy Though, Don't Book All Inclusive & FEED TOUR OPERATORS, BOOK THE TRADTIONAL WAY HOTEL B&B, APARTMENTS, VILLAS, ETC. Please help the People of Zante, Use Their Bars, Hotels, Restaraunts Etc. Lets Have The True Zante Back. The Reason So Many Bars Etc Have Gone Is. GREEDY TOUR OPERATORS, Trying To Force The Issue, & Getting Away With It. O.M.G... I HAVE BEEN TO SOME AIRPORTS IN MY TIME..
we were told when the coach picked us up from our hotel that the flight was 15 mins early. We arrived at the airport to check in. Its not like cardiff you have to have your bags weighd first then take them over to be put through xray and then loaded on to the plane. Comparing the ordeal to 10 years ago it wasn't as bad as I thought it was going to be. The airport seemed alot more spacious and airy. Didn't like having to queue twice for check in though, once the check youself in and then once to send your bags through. Drinks and food expensive, if you want a drink is suggest you buy one from the duty free shop rather than the bar area. Things in the duty free shop not that cheap so suggest you buy goods in resort. Also you don't get very long at the airport, good job too as there is not much to do. Even though they have refurbished/built a new check in/lounge area not impresed with lack of technology, they had wrote all our seat numbers and names on the tickets, messed up though when they gave some people the same seat numbers, try wathcing that one be sorted out on the plane, especially when some people end up being split up through the airports error. Also check in very slow! well was surprised that the airport wasnt as bad as i thought it was..
not bad but hot need air conditioning turnly up!!! They have a much better system to get people in quickly we were left standing out in the heat 2 years ago! The airport toilets are way better everything is new now its been modernised, the duty free shop is good lots of metaxa and ouzo!! I bought some of the strawberry sweets we like and greek chocolate. Lots more seats and as some people got up to go it wasnt long til our flight was called. Our daughter had a baggette and we had drinks was expensive but there again it always was!! Even so we love the new airport. We went to Zakynthos for 11 days for our honeymoon. When we arrived to the airport, everything was fine, we received our luggage very quickly. On the way back we showed our EU passports and our flight tickets at check-in desk but suddenly we became suspicious just because we were the only Europeans traveling with a British travel agency Thomas Cook and didn't have British passports. We were asked to move away from the check-in desk and wait because they went to check our passports.I even have the staff my passport and my ID. The British staff then came back with our passports and my ID which were fine and still wanted to see other forms of ID! Then they wanted to see any proof of residency in the UK like bank card, credit card or NI number. They also asked for our hotel details on Zakynthos. We felt like criminals there! Because we are in the EU and there is a free movement here, they haven't got any right to ask for this if we haven't done anything wrong. We have never had such bad experience on any other airport before. I understand that they have right to check our passports in their systems but do they have a right to treat us worse than others just because we haven't got British passports?? ?We have lived in England for many years and paid tax here and spend our money here and we thought it would be a good idea to buy our holiday in UK travel agencies. But if they treat us this way, we will spend our money in European travel agencies and we will also tell our friends and relatives not to spend their money with British travel agencies for holiday. Maybe all Europeans traveling with British travel agencies should keep a proof of their DNA in their pockets to keep them happy! just returned from zante,i was expecying the old airport as i had not been for 2 years,what a difference,lots of space and plenty of seats (they have added more seats since the virtual tour was done) upstairs and down.Still no change in the snacks though (cheese pies) CHEESE CHEESE and more CHEESE.also there are new loos you dont have to go underground anymore although the handwash was in a water bottle (well you cant have everything).well done zante. Waspies are abit of a nuisance,no sooner had we got outside arrivals 1 headed str8 into my daughters cleavage ,mass evacuation lol lol,happily she weren't stung and the waspie weren't too traumatised either,can't say that for my daughter tho! I have been in June and never really been bothered with them then. From July onwards they are more inclined to be around to annoy you unfortunately as I have experienced when staying in July/August/September!! Am looking to go to zante for 2 weeks next year in either June or September. Have heard that they have a big problem with wasps and wonder if anyone who has been in either of those months can confirm or deny this. I have just arrived back from Zante on 3rd August and I must say that the airport was fine. You do have to queue 'inside' for an hour or so but I can't see why people have to rush through the checkin procedure? Once through there is a shortage of chairs so you will almost definetly have to spend some of your time sitting on the floor, at least whilst waiting to check in everyone is in the same boat and it isn't as bad as some people suggest so don't let travelling home ruin your holiday. In fact when we flew out from Manchester at 7.20am, when we arrived at the airport we had to queue for 1 hour 15mins before we were checked in as there were so many flights out !!! In Zante airport the holiday reps tell you which queue to stand in and they are waiting at the front, middle and back of all the queues just in case you get confused in the mayhem so that should really put your mind at rest. One thing that I would say though is make sure you take a drink to the airport, (especially if you have kids) and drink it before you check your bags in. At least that way you won't die of thirst. 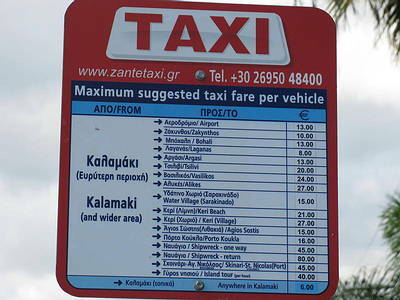 I last went to Zante in 2005 and it was dodgy then but not that bad- guys its just an airport and its only a small island and how much time of your holiday do you really spend there? a few hours. So stop moaning and enjoy the holiday! im going again in sept and cant wait not worried about the airport at all! Definitely much improved from last year in that there is no waiting for ages outside in the sun...just waiting ages inside but with air con! It was very well organised though as the tour company reps make sure that you are in the right queue and filter you through the various aspects of check in, passport control etc. Yes, the snack bar is expensive (and it is only snacks such as baguettes, sausage rolls, crisps etc) but, as I've reported previously, aren't all airport food and drink outlets one big rip off? Much better toilet facilities in the new departure area BUT still nowhere near enough seats to cater for the vast numbers of flights which leave the airport on Sundays. We were delayed 1.5hours and did manage to get a seat for a while so better than last year when we sat on the steps leading up to the duty free shop. Greek air traffic control and Zante airport conspired to delay us both going to and leaving Zante. On the way out we sat on the plane at East Midlands airport for 2 hours waiting for Greek airspace to clear us to land at their end. Then, when we got to within sight of Zante, the plane diverted to Kefalonia as the pilot (allegedly) had been told to circle for 1.5hours as there was no space for us at Zante airport. He hadn't enough fuel (allegedly) and so diverted to Kefalonia where we sat on the plane for another 1.5 hours. We were all somewhat concerned that we were not taken off the plane whilst it was refuelled. In the event of a fire, we would have stood very little chance of getting off the plane as they only opened the front two doors to allow the airport staff to keep coming on board to liaise with the captain and cabin crew. We'd been on the plane for so long (from 6.45a.m. - 2.20p.m. in total) that the toilet system was full so they had to empty that before we could take off for Zante. During all of this time, they only did the normal meals and drinks service during the actual flight. No such thing as complimentary drinks, either, which given what we'd gone through would have been a small but nonetheless welcome gesture from First Choice. Talking to other passengers, we all felt the same that the captain and the cabin crew were all rather blase about the delays but the crew on the return journey were so much more professional, friendly and helpful. Thank goodness Zante is such a beautiful island that it worth the hassle of getting there and back....when we went last year we were delayed 5 hours going out (technical problems with the plane (allegedly) and about an hour coming back.....First Choice again........perhaps I'd better book with another airline in future.